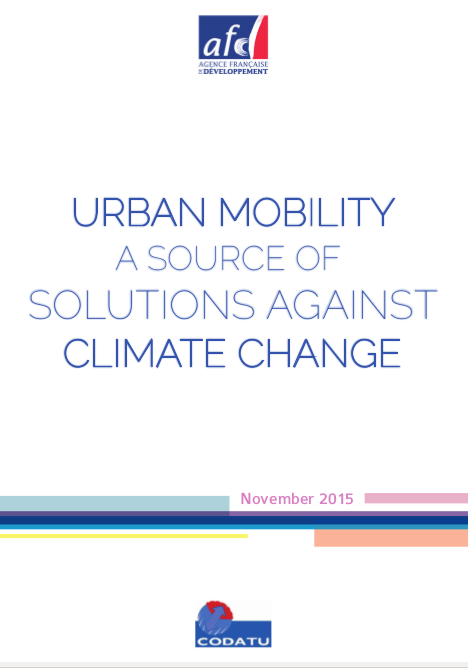 and CODATU publish a book presenting the low-carbon urban mobility solutions that meet both local and climate issues. The transport sector produces 15% of the world’s greenhouse gas (GHG) emissions, or 7 Gt CO2eq, three-quarters of which is generated by road transport, both urban and long distance. The transport sector alone generates more than 23% of CO2 emissions from fossil fuel burning. According to the Intergovernmental Panel on Climate Change (IPCC), “without aggressive and sustained GHG mitigation policies being implemented, transport emissions could increase at a faster rate than emissions from any other energy end-use sector, rising from 7 to 12 gigatons of CO2 equivalent per year by 2050.” The transport sector would thus be the biggest emitter of GHGs. Given this outlook, more and more political leaders are observing that it will not be possible to meet the 2°C target without an in-depth transformation of the transport sector. The challenge of low-carbon mobility has thus become a major climate issue. Central to this issue is urban mobility, as it accounts for more than one-third of transport sector emissions. Besides its impact in reducing GHG emissions, the transformation of urban transport systems responds to local needs that are powerful drivers of change. The idea is to ensure “livable” cities despite their very fast development and the growing flow of cars and motorbikes that is degrading people’s living environment and particularly that of the most disadvantaged. The challenge is thus to limit the congestion of road infrastructure, which paralyses cities and reduces their economic growth potential; to limit air pollution, which has become a real public health challenge in metropolises; and lastly, to improve road safety. Solutions do exist to resolve these local problems while fighting climate change. The document aims at presenting the different levers for actions and the tools that can be used by local and national decision makers. It underlines the challenges of the coordination of stakeholders, the consistency of policies, the integration of transport modes and the implementation of long-term funding models.